Our first and last night in Tanzania were at the San Salinero hotel in Moshi which was a beautiful place with a pool, masseuse, bar and restaurant - the perfect pre and post climb place to stay, despite a wedding taking place right outside our lodge when we arrived back, filthy and exhausted from the mountain. I'm not sure we were quite what they had in mind for the background of their wedding photos! 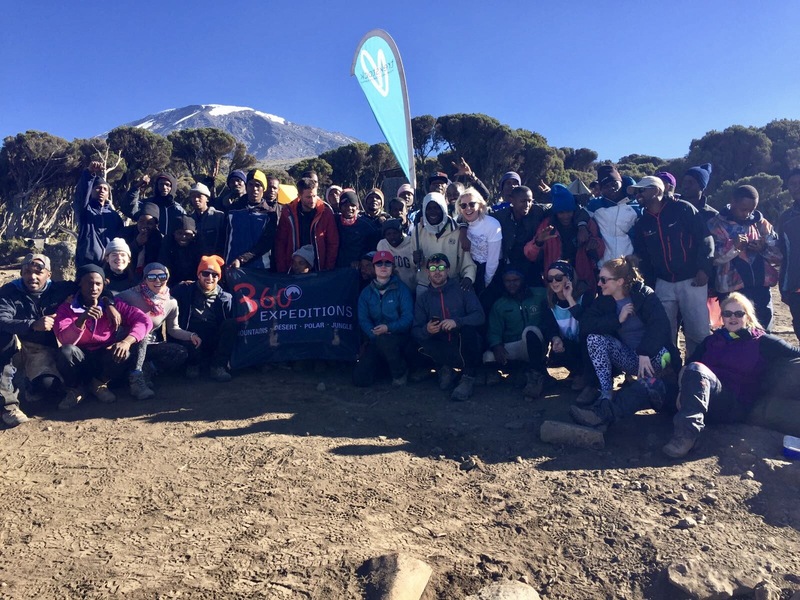 We climbed Kilimanjaro via the Lemosho route. One of the most popular routes, the focus is walk high, sleep low. The route takes you round the side of the mountain, traversing from north to south round the west side. Being the only route I've taken to climb Kilimanjaro(!) I can't compare it others but it is meant to be a very accessible route for beginners. A four hour drive took us from Moshi to the start gate, already nearly 3,000m above sea level. Every day of the trek is different, crossing different landscapes and terrains, all above the clouds. Walking times range from around four to ten hours a day, always heading up, before coming down to camp. Night one was camping at 3,300m, then on to 3,900m for night two, three and four. Day three was particularly tough as we headed to Lava Tower for "lunch". I say "lunch" as I think 90% of us were suffering from altitude sickness as this point so I don't think we ate much at all. We'd walked for over six hours to get there and had another four hours walking to get back down to that night's camp, where we all collapsed in a heap, trying to get some sleep for the day ahead. Because the day ahead involved climbing a wall. As much as I tried to picture us as Wildlings clawing our way up a wall in Game of Thrones, I was terrified about the wall climb. But my fear was unfounded and I actually really enjoyed the challenge of the wall. It was less climbing, and more clambering, but lots of fun, and a huge sense of achievement once we got to the top. The trek was obviously physically challenging, but nothing we couldn't handle. In fact, I found the walking/climbing/trekking the easiest part of the week. 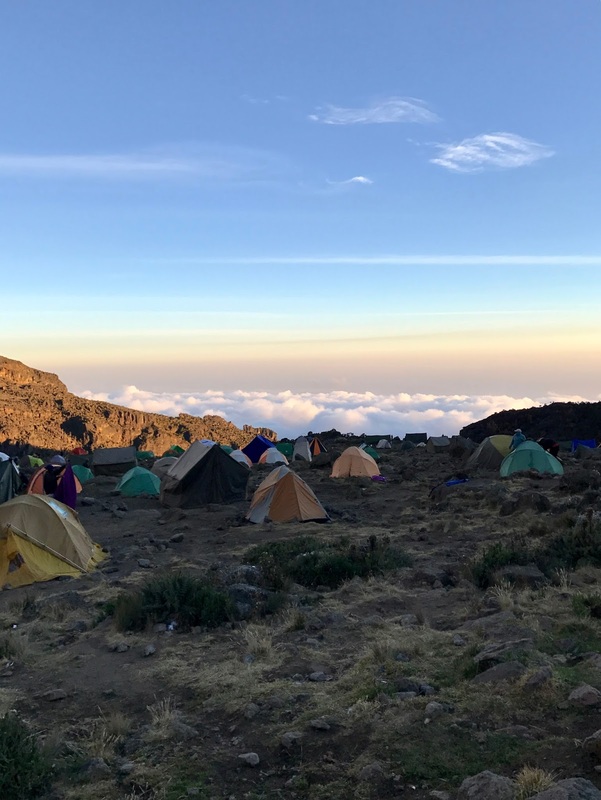 It was the cold nights, sleeping in tents on rocky grounds, lack of home comforts, dodgy tummies, altitude sickness and constant dust and dirt that were the real challenges. As far as training was concerned I did no hill or mountain training, just a lot of walking round London. So, after five and a half days walking up and down and up and down and up we got to base camp, which is 4,600m. We arrived at lunchtime, after which we were sent to bed. Trying to sleep at 2pm knowing that by that time the next day we would've summited and be back at base camp was pretty surreal. So we napped for a couple of hours, got up at 5pm for dinner, went back to sleep till 11pm, then it was time to summit. I don't think I can put in to words what we went through. Midnight comes and you set off in pitch black, clambering over rocks, lit only by the brightest stars I've ever seen, and our head torches. Mine broke. I didn't care. The elastic holding it on was tight, and the dwindling oxygen was hurting my head anyway so I took it off and made sure I stayed in line, seeing the rocks by other people's lights. And on you go, for hours and hours. It's freezing - minus 15. No one really talks as every word you say empties your lungs of precious oxygen so you stumble along, trying to think of happy things, stopping occasionally so you can have a sip of water without losing your breath, that is if your camelback hasn't frozen solid. You're told to take snacks to keep your spirits and sugar up. Honestly, the last thing in the world you feel like doing is eating. Having stocked up with more nut-and-smushed-up-raw-things bars than you can imagine, we bought an emergency pack of Jelly Babies at the airport and they were the only thing we could manage on summit night. Each one taking what felt like years to chew and swallow, but noticeably increasing our energy. At about 3.30am one of the guides told us we were halfway. Halfway distance wise. So not halfway time wise, because with oxygen levels decreasing so did the pace. But we carried on. And on. Waiting desperately for the sun to come up and shine some light and warmth on us. And finally it came up. You expect it to be amazing, to be life giving. But it had completely the opposite effect on me - now I could see where we were going and I still couldn't see the top. I was broken. The rocks we'd been clambering over turned into grey, dusty gravel. I can't really remember the next couple of hours but I know that every step we took felt like we were going backwards as our feet slipped in the dusty sand. But then finally, you see the top and you know you can make it. And we did. We all made it to summit. Via the evil, fake summit (Stella Point) - you think you've made it to the top, and then they point to the real summit. Kilimanjaro was a volcano so the top is a crater. And the bit you arrive at isn't the highest point of the crater. So another hour's walk round the top of the crater at 5,500m+ and you finally get there, to Uhuru, at around 9am. We were elated, exhausted, emotional, and just wanting to go straight back down. It's such a weird feeling. I don't think I was happy, just relieved. And wanting oxygen. So then you go back down. And if we thought going up was weird, going back down to base camp was even weirder. You basically ski down the gravel/sand. Without skies. Like something out of Mad Max, sun in your eyes, stripping off layers, dust clouds everywhere. Having taken nine hours to summit it takes about two to get back down. A quick nap, lunch and then down you go again to High Camp. One last night's stay on the mountain and one last morning waking up above the clouds, then a 20km hike through the jungle to get off the mountain and you're done. Just like that! I'm not sure what I was expecting food wise on the mountain, but it was really pretty impressive considering the facilities!! And it needed to be - on summit day alone we burnt over 5,000 calories. Breakfasts were a selection of porridge, omelettes, sausages, pancakes, avocado, oranges and toast with ketchup depending on the day. Lunches and dinners were carb heavy - pasta, rice, chicken, chicken curry, fish, fish curry, bolognese, some sort of cupcake things, chips(!) and other bits and bobs. Oh, and soup. Vegetable soup - sometimes cucumber, sometimes courgette, sometimes "mixed". All of which was cooked in a tiny kitchen tent over two hobs. It was actually incredible what they produced. They even whipped up pil pil sauce for us after the jar we bought on the first night in Moshi got left on the van. And not only were they feeding us, but all the porters and guides on the trek too. The people on the trek were amazing. There were 10 of us doing the trek for Trekstock, who'd all flown over from London together. Most of us had never met, though I was soooo lucky to be doing the trek with my bezzie, Lucy, who got me through the toughest times, and without whom I wouldn't have wanted to be there. But the whole group were amazing. We all got on so well, there were no rows or harsh words spoken, despite the huge emotional rollercoaster you go through. Everyone looked out for everyone else. When one person was down another picked them up. And we were all there for the same reason - to raise money for this incredible charity. But the most amazing people on the trek were the porters and the guides. For 10 us, we needed 37 of them. That's four guides, three back up guides, and 30 porters. They carried and put up our tents, sourced and cleaned water so we had an endless supply to drink, brought us coffee in the morning and bowls of warm water to wash our faces, took medical supplies and oxygen up the mountain, carried ten times more than we did wearing only trainers and jeans, and always, always had a smile on their faces for us, and more often that not, a song and a dance to welcome us into camp or see us on our way to a day's trekking. They were the life and the soul of the trek. And they do it week in, week out. What for us was a once in a lifetime challenge and struggle, is their job. They spend weeks away from their families, sleeping in the freezing cold with no home comforts. They got us up that mountain. Kilimanjaro was amazing beyond words. The challenge of a lifetime and something so un-me, so out of my comfort zone, and something I still can't believe I've done. But if I can do it, you can do it. If you've ever thought about doing it, then do it. Do it for charity - give yourself a reason to get up it. You'll need one, but it will be the best thing you've ever done.